Broadcast premiere of Mark-Anthony Turnage's Coraline, based on Neil Gaiman's much-loved story. Soprano Mary Bevan is in the title role and Sian Edwards conducts Britten Sinfonia. Kate Molleson presents the world premiere production of Mark-Anthony Turnage's Coraline - an operatic version of the dark fantasy tale by Neil Gaiman, directed by Aletta Collins with libretto by Rory Mullarkey. Soprano Mary Bevan sings the title-role with a cast including mezzo-soprano Kitty Whately and baritone Alexander Robin Baker who are making their Royal Opera debuts. Sian Edwards conducts the Britten Sinfonia. Neil Gaiman has transformed the landscape of children's literature with his highly inventive, atmospheric and otherworldly narratives. His prize-winning novella, Coraline is packed with astonishing imagery - a much-loved story about a girl who discovers a door in her parents' house, leading to an entirely different place and family. For Mark-Anthony Turnage "the fundamental message beneath the story is that we shouldn't be afraid to do what we believe is right. Coraline is brave, not because she doesn't cry or get scared, but because despite these things she still tries her best and doesn't give up. That's why I wanted to write Coraline, because here's a message well worth telling; through opera or in any other way." Singer: Mary Bevan. Singer: Kitty Whately. Singer: Alexander Robin Baker. Singer: Gillian Keith. Singer: Frances McCafferty. Singer: Harry Nicoll. Singer: Dominic Sedgwick. Orchestra: Britten Sinfonia. Conductor: Sian Edwards. Coraline Jones is bored in her family’s new house, and anxious about starting a new school. Her Mother is too busy unpacking to pay her attention, and her inventor Father is preoccupied with creating a machine to eradicate waste. Coraline decides to explore the house. She uncovers an old mirror and discovers a secret door hidden behind packing cases. She persuades her Mum to unlock the door (even though she hears the voices of Ghost Children telling her to beware) but the room behind it is bricked up. Coraline goes to visit the neighbours. She meets Mr Bobo, who has trained a mouse orchestra, but he is worried and sad because his mice don’t seem to want to play. Next door she goes to have a cup of tea with the out-of-work actresses Miss Spink and Miss Forcible. They read her tea leaves and warn her that she is in danger. Coraline is confused. Back home, Coraline is really unimpressed with her Dad’s turnip soup, which he’s made for lunch. After having had such a bad day so far, Coraline decides to return to the secret door. The Ghost Children’s voices urge her not to open it but she ignores them, despite being scared. The space behind the door is now mysteriously open and Coraline walks through into another room. 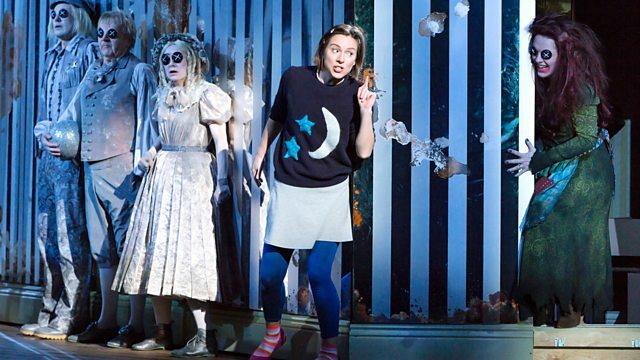 In this other house – which looks just like hers – Coraline meets a Mum and Dad who seem identical to her own parents, but have large buttons sewn over their eyes. They are extremely friendly and offer Coraline delicious food, endless play time and whatever toys she likes. Coraline is rather taken with this new life. Her neighbours seem equally fun. The Other Mr Bobo’s mouse orchestra is playing like a dream and the Other Miss Spink and Miss Forcible are busy rehearsing their new act. But Coraline begins to get worried by the way everyone has buttons sewn over their eyes. The Other Mother tells Coraline that she can live with them and have anything she wants, provided that Coraline lets her sew buttons over Coraline’s eyes too. The Ghost Children warn her to beware of the Other Mother and Coraline asks for time to think. Other Mother tells her to come back soon, and Coraline escapes. In Coraline’s real house, everything is deserted, and the neighbours have gone away. She tries to be brave and makes a sandwich, but it’s disgusting, and she can’t stop worrying about her parents. She begins to think that they’re not coming back and that she’ll never see them again. The children’s voices tell her to look in the mirror, and she hears her parents asking for help. The Other Mother has taken them. She must go back to her Other House and rescue her parents. Coraline goes back to the other house. Her Other Mother seems much stranger than before; she looks wild and witchlike and keeps eating beetles. Coraline asks for her parents, and the Other Mother conjures up a vision of them telling each other that they’re pleased Coraline’s gone. Coraline is upset but refuses to believe the Other Mother, because she knows her real parents would never say such a thing. The Other Mother gets angry, locks the door back to the real world and swallows the key. When she goes to make Coraline a snack, the Other Father tries to help Coraline escape; from his hints, Coraline realizes that the Other Mother has trapped her parents in a snow globe on the mantelpiece. The Other Mother becomes suspicious. She makes the Other Father vanish, and when Coraline won’t tell her what they were talking about she throws Coraline through the mirror. Behind the mirror, Coraline meets the three Ghost Children, whose voices warned her of danger earlier on. Each wears clothes from a different century – the 18th, the 19th and the 20th – and each has buttons sewn over their eyes. They can’t remember their names, but they do know that they were trapped by the Other Mother after they went through the secret door. When she got bored of them she threw them through the mirror and they have been imprisoned there ever since, never able to see their parents again. The Ghost Children tell Coraline that she’s doomed. However, Coraline is confident that she can find a way to save them all. When she was small her Father told her that you are brave if you confront what frightens you. Coraline calls out to the Other Mother and suggests a game. If Coraline can find her parents the Other Mother has to free them all. If she can’t, the Other Mother gets to keep Coraline. To try and trick the Other Mother, Coraline tells her that she knows her parents are behind the secret door. When the Other Mother tells her she’s wrong, Coraline challenges her to prove it. The Other Mother regurgitates the key and unlocks the door. The Ghost Children jump out and seize the Other Mother, and Coraline grabs the snow globe and key and runs back to her own house. Back in her real house, Coraline’s parents claim they’ve been there all along. They’re on good form and her Father tells her that he’s managed to make his machine work. The Ghost Children are also released: Coraline can see them in a painting on the wall having a picnic. But they warn her that the Other Mother’s right hand got chopped off and escaped through the door and is out to get her and take the key back. Coraline decides to trick the hand. She sets up a dolls’ tea party and puts the key in the centre. As the hand rears up to grab it, Coraline catches it, wraps it up, and throws it into her Father’s waste disposal machine, where it vanishes in a puff of smoke. Coraline has saved her family, and realizes how much she loves and appreciates her parents, and that she can confront whatever frightens her.